About a 100 ft down the trail from Dickson Hall, this is the my go to spot. There is a nice wooden bench, a rock walkway and hard to miss the pretty flowers. 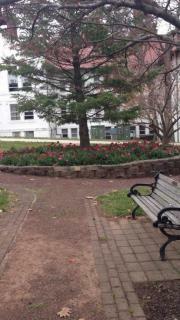 Sitting on this bench, looking at the brightly colored flowers always brightens my day no matter what. It is a good spot to sit down, relax and take in what nature has to offer.